Want to know why you feel like you can’t get much accomplished at work, regardless of the number of hours that you put in? It’s because you spend two days each week on administrative grunt work: the repetitive activities required to get something done, but that aren’t core to your job. And you’re not going to get a raise for doing them well. When was the last time you were rated on things like email, making phone calls or updating spreadsheets? How about putting together status reports, filling out forms or requesting support services? Probably never. But here’s the kicker, if you don’t do the drudge work, then the job you’re actually paid to do can’t get done. It was one of the more dramatic U-turns that Microsoft had ever made: undoing the error that was Office Web Apps and providing well-provisioned, fully functional and free versions of the major Office suite applications, first on iPad and later on Android. In fact, Microsoft rolled out the new Office look and feel first on those foreign platforms before dealing with the domestic issue of making Office at home on Windows once again. Microsoft took the hit for it, waiting until just last February to produce the touchscreen version of Office for tablets that the company had promised back in 2011 for Windows 8. Now that these preview apps are freely downloadable from the Windows Store, desktop PC users everywhere have been wondering how long they have to be stuck driving, if you will, an outdated vehicle. There is still no final release date, but during the Build 2015 keynote in San Francisco yesterday, developers got their first glimpses of Office 16 (version No. 16 and also, quite likely, 2016) for the classic Win32 desktop platform. We’ve got more content at our fingertips than ever before. And the content that we access on our mobile devices is increasingly important for our job responsibilities. While it’s a step in the right direction that enterprises are trying to ensure employees can properly engage with the content they need to be productive, many are losing the fight in the “content is everywhere” paradigm. Think about it: IDC estimates that the digital universe is doubling every two years and that by 2020 the data we create and replicate annually will reach 44 zettabytes (that’s 44 trillion gigabytes). It’s no wonder organizations are struggling to reap the full value — or currency — of the content that exists across the enterprise. You have to love the value email marketing can bring. Its purpose – whether to announce a sales event, share news or introduce a new product — is universally understood from your neighbor down the street to the clients and customers who are still reluctant to own a Facebook account. Email marketing gives small business owners an intimate way to reach the “everyone else” of their market. And that’s where its power lives. But not all email marketing is created equal. Spam arrives there just as much as valued email. So where do small business owners start in tweaking an email marketing campaign to capture what is most important? In many organizations, the marketing function is still viewed as a cost center instead of a revenue driver. Part of the reason is inertial, formed from years when top marketing executives ran departments instead of taking responsibility for their businesses. But these days, plenty of CMOs say that thinking and acting like a business leader is the single most important driver for their success. Key to this approach is a focus on business results. AvePoint just released a new service pack that lets you share and sync files in and out of SharePoint, through the company firewall. More accurately, AvePoint has upgraded its Perimeter Service Pack 4 that allows file syncing and sharing in both directions. Daniel Wilkens, product manager at AvePoint, called it a substantial upgrade that extends Perimeter’s functionality from one-way sharing of information to two-way collaboration. It allows people outside of the organization to use Office Web Apps "to securely edit content shared with them or upload new content to shared folders or libraries within the Perimeter Portal," he said. Marketers have hundreds of marketing technology choices, which can make choosing the right ones for your business overwhelming. Making the right decisions can have huge impact on the future of your brand. Dr. Frankenstein had choices, too. He made the wrong choices. He built a monster and, then he lost control of it. Don’t be Dr. Frankenstein. Don’t lose control of your technology. Whether you buy a marketing cloud solution or elect to build one yourself, you need to understand how to avoid creating a Frankenstein monster (to borrow Travis Wright’s term). These five practices are a sure-fire way to build a marketing technology Frankenstein—a platform that will hinder your marketers more than it’ll help them. Avoid these at all costs. Do you feel a bit like a slave to your social media? Always thinking about your next blog post, forgetting to respond to that guy on Twitter, and never Pinning at the right time? I know what it’s like to always feel like you’re running to catch up, instead of being in control of how and where you spend your time. There’s nothing wrong with flying by the seat of your pants and only writing or hanging out on social media when inspiration strikes – if it works for you. If you’ve found that’s a little too chaotic to be sustainable long-term, then you’ll benefit from being more intentional with your time. Which frees you up to have even more of it. If it’s one thing I hear the most, it’s that bloggers don’t have enough time in the day to do all the things they want to (or think they should) to build their blog and make it the best it can be. Time is finite, it’s so easily wasted, and yeah, it feels like there’s just not enough of it. Many of us are working on our blogs in the cracks of time we have around other work, family, and life commitments, and there are periods where we feel as though we are succeeding at the juggle about as well as we’d succeed at performing brain surgery on a puppy. The reality is, you have to make time. Nobody is going to walk in, grab your kids and say “we’re going to the park, you blog for a couple of hours” (are they? If they are, can you send them to me?! ), or take on a big project at your day job to free up time for you to finally get started on that eBook you’ve been putting off. If you’re not scheduling in time to blog, and scheduling your posts and social media updates, then of course you’re not getting as much done as you would like. To be honest, I don’t know of any blogger who can sit on the internet all day and respond in real time, whether that’s publishing at the most appropriate hour, or answering every email, tweet, and Facebook message received. Nobody is up at two in the morning Pinning their latest posts because that’s when their particular audience is online (hello working from the Southern Hemisphere). There are some people who like to read my blog at five in the morning. There are hundreds who come after I’ve gone to bed at night. The last thing I want to do is hit publish before sunup, but I also don’t want to miss out on the traffic that comes at the most convenient time for them, so post scheduling works in both my favour and theirs. I know sometimes the word “schedule” makes people shudder, and they’ll tell you they prefer “flexible” any day. Schedule sounds locked down, tight, rigid. The beauty of working online is so we can publish immediately, spontaneously, and so we don’t have to toe the line of a 9-to-5. But done right, scheduling can bring freedom – what you want is a flexible schedule, something that works just for you. Scheduling means I can more effectively work around my young family, who I really do have to respond in real time to. When my work is scheduled and my home day goes awry, I’ve got the flexibility to be present in the moment. If home is quiet, I’ve got the flexibility to blog and maybe set a few more scheduled posts and updates for the times I can’t be online. This kind of flexibility is invaluable. One of the biggest lessons I learned last year is that I don’t work well in chaos. Trying to work, live, run a family, and blog all at once however I could fit it in was benefiting no-one. Least of all me. I felt stressed, constantly undone, forever forgetting things, and I went to bed almost every day knowing I’d let at least one person down. Feeling always behind the eight ball is not how I want to get through each day long-term. I don’t want to feel reactionary to each situation as it arises, I’d rather be a step ahead, with a clear head, and proactive. Scheduling allows me to control my time online, instead of it controlling me. I can write when I want, I can publish when I want, I can be on social media when I want, and there’s flexibility at the end of the day to rejig it if necessary. My readers get content in the times that work for them, and I can interact in the times that work for me. Win-win! 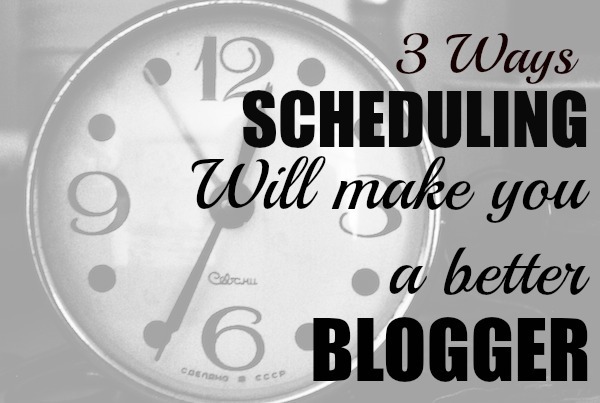 Well, OK – the beauty of scheduling means you can blog without actually physically being present. But the times when you are online, you can be fully present. This is your time to blog, to interact on social media, to chat on Twitter. You don’t also have to be cooking dinner, finding gym shoes, or emailing your boss. You can work when you’ve got the time spare, and you can concentrate better during that time. So many mistakes are made when you rush, when you’re throwing something up and running out the door. If you’re writing something that isn’t going up until next Tuesday, there’s no rush. You can write, edit, and give it a once-over between now and then, picking up issues, typos, and adding that link to the article you just couldn’t remember at the time. When you’re fully present with your writing or your social media, you write better and are more likely to avoid problems that crop up when your concentration is divided. You look more in control and authoritative. And you’re interacting when it’s best for you. I know what it’s like when you’ve just found five cool things that your readers will love, but you can’t share all five at once – and you’re likely to forget or give up if you physically post them across a reasonable period of time. Scheduling helpful or funny articles at the times your audience would most like to see them (i.e. when they’re online and they’ve actually got the time to click through) means you’re being the most useful to them you can be. And we all know Usefulness is King! You’re also not rushing to share something, anything in order to be seen – you’re sharing what’s useful, entertaining, or inspiring because you’ve got the time to find those things, and you’re giving it to your audience at the right time. I always say planning is essential to be more efficient and to use your time more wisely. In 5 Ways to Make Your Blogging Life Easier, I talk about planning (and scheduling + automating!) and how they can give you more freedom. In order to schedule your time and your content, you have to know what you want to do, where you want it to take you, and when you work best. I do everything from long-term checklists and calendars to a five-minute brainstorm and rough outline of the tasks of the day and in what order I’ll do them. I can’t recommend enough that five-minute brainstorm before you get started – it saves a lot of time and heartache later. Slotting your tasks into the time you have available that day will be the best thing you can do that morning to get started on the right foot. Then, of course, you can branch out into larger, more long-term goals and lists (and refer to those lists when writing your monthly, weekly, or daily plan). Get to know the automation tools available out there for bloggers – Buffer, Hootsuite, CoSchedule, Edgar, or whichever one works for you. Get to know when your audience is online, what kinds of updates they respond to, and what kinds of content you enjoy creating. There’s no point posting to Facebook 11 times a day if it’s irrelevant, uninteresting, or clickbait. Different apps work for different needs, although the ones I mentioned in the previous point usually cover several platforms. For example, I use CoSchedule to schedule my daily posts to Facebook and Twitter, and they make it easier to post way into the future. I can post several times to Twitter without leaving my WordPress dashboard. Facebook prefers its own scheduling tool, so if I can, I’ll delete the CoSchedule upload to Facebook and use the Facebook scheduler. If’I’m out that day, I leave the CoSchedule one – I do find that the Facebook schedule has better reach. I use Tailwind for Pinterest scheduling, Buffer for tweets on Twitter or tweeting articles from other sites, and I’m interested at looking into Edgar for a couple of other things I’ve got in mind. I’d love to know which one you use though, and why? I think they’re all useful for different things.